Around 1.3 km in the earth’s crust, at the Beatrix gold mine, in the Free State, the ‘devil’ lives in a small pocket of fissure water. Or, to be more accurate, it is here that a small microorganism named Mephisto has its home. This asexual worm’s name is derived from Mephistopheles, ‘he who loves not the light’, alluding to the devil, or Lord of the Underworld, in reference to Germanic folklore and, specifically, the Faust legend. The organism’s address is about as hot, dark and inhospitable as its name would suggest: shaft 3, level 26, corridor 28, in a pocket of water that is very, very old – fissure water is a closed, undisturbed underground environment. In fact, carbon-14 data indicate that the fracture water Mephisto was found in is 3 000- to 12 000-year-old palaeo- meteoric water, explains University of the Free State (UFS) Department of Microbial, Biochemical and Food Biotechnology’s Professor Esta van Heerden. Mephisto was discovered by a group of researchers from Belgium, the USA and UFS. So, who, or what, is Mephisto – or, to use the full scientific name, Halicephalobus mephisto – exactly? Van Heerden describes Mephisto as a nematode, which is a lower-order eukaryote. And, if that does not make sense, think of it as a multicellular organism that is 0.52 mm to 0.56 mm long, including a rather ‘long’ tail. It is also important to know that Mephisto does not necessarily live in mines. However, because South African mines are some of the deepest man-made excavations on earth, they provide easy access to rock formations and groundwater far below the earth’s surface. But why the excitement – the research team’s discovery made it into the authoritative Nature journal – about an incredibly small microorganism such as Mephisto? “We were particularly excited about this discovery because researchers have always felt only single-cell organisms can survive in those harsh underground conditions. The discovery of Mephisto asks researchers to revisit this theory,” says Van Heerden. Also, living so deep underground means Mephisto can tolerate high temperatures, at over 40 ºC, while it was also found that it reproduces asexually and that it feeds on subsurface bacteria. And it is actually all of these characteristics that mean Mephisto will, most likely, turn out to be one of the good guys. Mephisto is an extremophile. Extremophiles are microorganisms that have adapted over millions of years to survive in very harsh conditions, explains Van Heerden. They were first discovered in the 1960s in the hot springs of the Yellowstone National Park, in the USA. “These bugs have amazing abilities. They can live in extremely high or low temperatures, high pressures, at low or high pH values – many extreme conditions that humans cannot survive,” notes the biochemistry professor. “They can even withstand radioactivity. They really have evolved over millions of years to adapt to these conditions and must, therefore, have amazing properties. It is exactly these characteristics that make extremophiles useful to scientists, while it also hints at where and how to look for life on other planets. 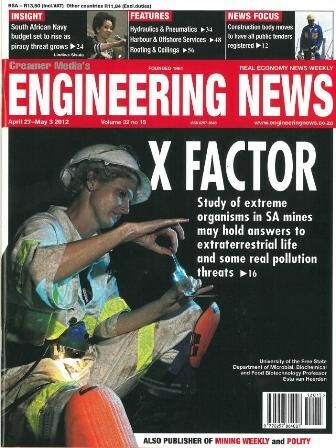 The search for extremophiles in South Africa goes back to 1996, when American geological researchers discovered a living microorganism at a depth of 3.2 km in a borehole in a South African gold mine. It was alive, despite being trapped there for millions of years. Further investigations saw the discovery of more extremophiles, which, in turn, led to the establishment of a new research project, largely headed up in those early years by the world-renowed Professor Tullis Onstott and his team from Princeton University. This group then also received membership of the USA National Aeronautics and Space Administration’s (Nasa’s) Astrobiology Institute. Van Heerden has been involved in this collaborative research project for around ten years, and has also been invited to speak at the Nasa Astrobiology Institute’s executive council meeting. “In a research visit during my PhD studies, I worked in a department in Marseilles, France, where extremophile organisms were isolated. When this specific project was introduced to me, I jumped at the opportunity to work in this field, due to its exciting nature and Nasa’s involvement,” says Van Heerden. But why would a body such as Nasa be interested in the discovery of a little guy like Mephisto? If more complex multicellular organisms can survive in the deep subsurface of earth, this may be good news when looking for life on other planets where the surface is considered too inhospitable to support higher life forms, such as Mars, explains Van Heerden. It means complex life forms can be found in ecosystems previously thought uninhabitable. Mephisto’s existence, and the existence of other extremophiles, expand the possibilities into new areas where new organisms – alien life – can be found on the planets Nasa is exploring. AMD refers to the outflow of highly acidic water from abandoned mines, which has become quite a threat to cities on the Witwatersrand, both in terms of volume, as well as its impact on water and soil quality. Van Heerden says her extremophile research group has already filed six different patents, all structured around “very unique microorganisms or the role they can play in environmental clean-up processes”. “We are currently cultivating similar organisms on a larger scale to test their efficiency. “Most of these patents are directed at ways to clean up contaminated environments, such as where hexavalent chromium, uranium and AMD are present. The patents focus on the fact that we have such unique bugs, we should use them in systems tailor-made to their abilities,” says Van Heerden. Over the next two years, she hopes the research team will also be able to extend its research into larger-scale applica- tions, in order to present a number of actual industrial solutions. Van Heerden says South Africa’s geo- logy is “very unique”, and that any effort at a carbon storage process must be care- fully studied and supported by world leaders in this area of research. CO2 storage is a process based on capturing CO2 from large sources, such as coal-fired power plants and storing it, typically underground, where it will not enter and harm the atmosphere. The long-term storage of CO2 is a relatively new concept. The extremophile research field is addressing “very current issues”, says Van Heerden, and has many top international researchers contributing to this field. The UFS research at South African mines is funded by the Technology Innovation Agency, the National Research Foundation, as well as various companies. The international research parties in the group each have their own funding agencies, varying from the USA’s National Geographic Society (the body that publishes National Geographic) to the Deep Carbon Observatory, as well as the Sloan Foundation. “The South African research team consists of myself, postdoctoral research fellows, research assistance and talented postgraduate students,” says Van Heerden. She adds that the team works in several South African mines, including diamond, gold and platinum mines. “Almost all the major deep-mine groups contribute to the project, such as Gold Fields, Harmony and AngloGold Ashanti. The mining groups give us fantastic support and keep us updated as to when and where they find water. However, they also benefit as all data is given to them to help their exploration. “We have access to most deep mines in South Africa. However, throughout the years, we have expanded to shallower but very interesting mines. “South Africa has the deepest excava- tions on earth, allowing researchers access to extremely old water intersections. These might hold the key to some fantastic dis- coveries,” enthuses Van Heerden. She adds that each mine or geological niche has its own unique microorganisms that the research group has been charac- terising for the past ten years.